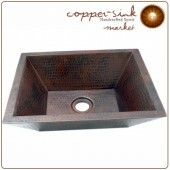 Our bath copper sinks are available as kitchen bar sinks and regular copper bar sinks. 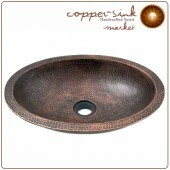 We have a nice collection of copper bar sinks available for your selection. Our copper bar sinks can be installed in a stand alone bar prep section, or as part of the kitchen bar. Our copper bar sinks are smaller in size compared to a regular sink, due to its use as a bar sink, on washing cocktail glasses, preparing cocktails and drinks, washing blenders, among other bar related activities which requires a smaller space in the washing section. If you’re entertaining guests at your kitchen or guest house bar, you want an attractive and sturdy sink. Mixing drinks, preparing food, cleaning classes – it all can take a toll, even on lightly used sinks like your bar sink. Installing a high quality bar copper sink can be a great move for making sure that you have an attractive bar sink that can handle years of wear and tear. Durable, high quality copper sinks can make a real difference in your kitchen, providing you with an easy to clean and maintain kitchen feature. 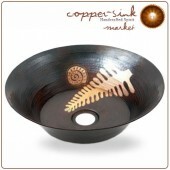 One of the great things about copper sinks is their resistance to harmful germs. Copper has been found to be naturally resistant to illness causing microbes and bacteria that contribute to illnesses such as staph infections and MRSA. By installing copper sinks, you can help protect yourself and visitors to your kitchen bar against food-borne and other illnesses that can often find sinks to be an opportune breeding ground. No matter how frequently you use it, or what you use it for, we have a copper bar sink in your kitchen that’s right for you. If you only occasionally entertain guests and primarily intend to use your bar sink to wash a few glasses and clean the blender, chances are that a single well drop in copper sink is the right option for you. However, if you frequently have guests over and use your kitchen or bar sink to help in food preparation efforts, having a double well or even a three bay kitchen bar copper sink installed may be a better option. The larger kitchen or bar sink will be more accommodating to large hams, chicken or other food you may need to let thaw in the kitchen sink, and multiple wells or bays will allow you to multi-task as you cook and clean your kitchen area. Also, it’s capacity will also reduce your need to make frequent trips in and out of the kitchen to collect glasses and other items for cleaning, making entertaining guests more convenient. 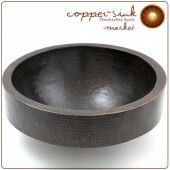 Enough cannot be said about the health benefits of using copper sinks in your kitchen. Drug-resistant bacteria and microbes are on the rise, and using copper sinks is one low-effort way you can help promote health and safety. 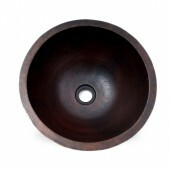 Copper sinks are durable, particularly ones made of high quality copper, such as the sinks we provide to our customers. Copper sinks are also available in a wide variety of types and forms, so no matter what the look you’re aiming for in your kitchen, copper sinks can accommodate your kitchen needs.